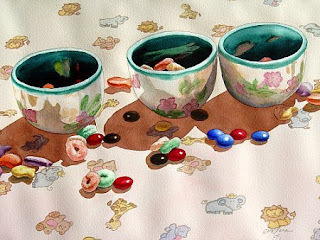 Transparent Watercolor 14" x 20"
The reflections onthose cups are incredibly beautiful. Love the subject! YUM. I just found your blog and I will come back again. I certainly admire Mr. Moms. And your artwork is scintillating. this is so great and the little animals rock. Very complicated. Excelente trabajo Pablo. Me gusta la composición y el tema.